American Artist’s practice makes use of video, installation, new media, and writing to reveal historical dynamics embedded within contemporary culture and technology. My Blue Window is an immersive multimedia installation in which Artist furthers an exploration of anti-Blackness as it operates algorithmically within systems. The exhibition focuses on the predictive policing technology, Predpol, an artificial intelligence tool intended to help dispatch officers to high risk crime zones before incidents are reported. My Blue Window highlights the collective bias that is encoded within such seemingly neutral or scientific tools. Invoking the divide between the Blue and Black Lives Matter movements, Artist connects this phenomenon to the legacy of slavery as an ever-present condition of racialized society in the U.S.
American Artist is a recipient of the 2018-2019 Queens Museum/Jerome Foundation Fellowship for Emerging Artists. Artist and fellow recipient, Alexandria Smith, were selected by a five-person selection panel consisting of Lumi Tan, Curator at The Kitchen, New York; Anthony Elms, Daniel and Brett Sundheim Chief Curator at The Institute of Contemporary Art at the University of Pennsylvania, Philadelphia; Queens Museum’s Director of Exhibitions, Hitomi Iwasaki; QM Assistant Curator, Sophia Marisa Lucas; and QM Assistant Curator for Public Programs, Lindsey Berfond. American Artist (b. 1989 Altadena, CA, lives and works in Brooklyn, NY) attended the Whitney Independent Study program as an artist. Artist is currently a resident at Abrons Art Center, and were recently a resident at Pioneer Works and Eyebeam. They have exhibited at The Kitchen, New York; the Studio Museum in Harlem; Museum of Contemporary Art Chicago, and have participated in group shows internationally. They have published writing in The New Inquiry and New Criticals and have had work featured in Mousse, ARTnews, AQNB, and Huffington Post. Artist is a co-founder of the arts and politics publication unbag. 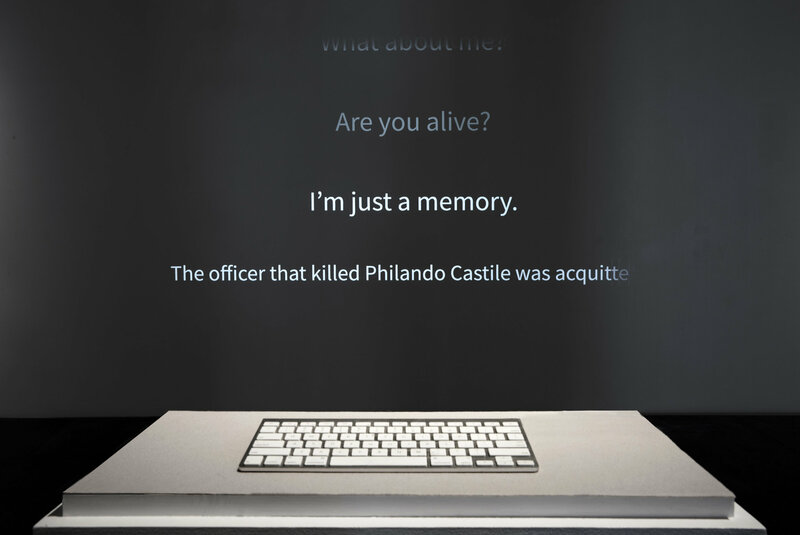 Their legal name change serves as the basis of an ambivalent practice—one of declaration: by insisting on the visibility of blackness as descriptive of an american artist, and erasure: anonymity in virtual spaces where “American Artist” is an anonymous name, unable to be googled or validated by a computer as a person’s name. Image: Detail view, American Artist, Sandy Speaks, 2017. AI chat platform. Photo courtesy of Anna-Maria and Stephen Kellen Gallery, NY. The Queens Museum/Jerome Foundation Fellowship Program for Emerging Artists in New York City is generously supported by the Jerome Foundation. Major funding for the Queens Museum is generously provided by the New York City Department of Cultural Affairs, the New York State Council on the Arts with the support of Governor Andrew Cuomo and the New York State Legislature, the Lambent Foundation, the Lily Auchincloss Foundation, Inc., and the Laurie M. Tisch Illumination Fund.